NEW YORK (CNNMoney) -- Beware your checking account. Consumers are still getting hit with unexpected fees and aren't receiving clear information about the costs involved with their accounts, according to a report by the Pew Safe Checking in the Electronic Age Project. The study examined the information on 274 checking accounts offered by the nation's 12 biggest banks and credit unions. "Consumers are expected to wade through long, confusing documents and may be subject to steep, unexpected fees to access their own checking accounts, the cornerstone of household financial management," said project director Susan Weinstock. In 2011, banks and credit unions made few improvements since the prior year's survey, Pew found. 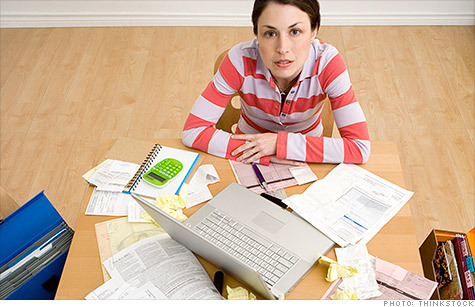 And in some cases, checking accounts have even become more costly for customers. The overdraft trap: Despite government efforts to protect customers from getting unexpectedly hit with nasty overdraft fees, banks are still finding ways to penalize customers who overdraw their account. In 2010, the Federal Reserve updated the Electronic Fund Transfer Act to prohibit banks from automatically signing up customers for overdraft protection. This service charges customers an overdraft fee every time they take out more money than they have available, instead of just declining the transaction. Now, customers are given the choice of enrolling in overdraft protection when they open an account. If they don't make a choice, they are opted out of the service. But Pew's study found that many financial institutions are failing to clearly disclose the costs associated with overdraft protection and that the fees are still unnecessarily high, especially when so-called extended overdraft penalty fees kick in. Overdraft penalty fees, which are charged the first time you overdraft your account, came in at a median of $35 at banks and $25 at credit unions, unchanged from the previous year's survey, Pew found. But extended overdraft penalty fees, which are incurred if your account remains overdrawn for a certain period of time, have increased by 32% to a median fee of $33. About 99% of checking accounts charge an overdraft penalty fee, and 64% of those accounts also incur an extended overdraft fee -- up from 45% in 2010. When a customer signs up for overdraft protection, many banks are also using a tricky tactic to increase their odds of being able to assess fees, according to Pew. The banks are able to reorder an account holder's transactions, and withdraw the transactions for the highest amounts first and the smallest last or post withdrawals before deposits instead of processing them chronologically. This can lead the account into overdraft more quickly and cause the transactions that follow to spark multiple overdraft fees. Banks and credit unions also try to keep you on your toes by referring to overdraft penalty fees under various terms. Pew found that credit unions, for example, use eight different terms to describe this same fee, including "optional overdraft protection service transaction," "courtesy pay fee," "non-sufficient funds [NSF/OD] preauthorized withdrawal," "bounce protection," "courtesy clearing," and "paid NSF." Pew is calling on the Consumer Financial Protection Bureau, the government's new consumer watchdog, to limit and provide better disclosures for these fees -- which it says cost customers billions of dollars a year. The CFPB is currently seeking public comment on a sample overdraft penalty fee box that would clearly explain the total overdraft fees charged for the amount that the account was overdrawn. It has also launched an inquiry into overdraft programs to find out whether they are harming customers. To conduct the inquiry, the agency has requested data from a number of banks and will look at transaction reordering, missing or confusing information, misleading marketing materials and whether the service is having a disproportionate impact on low-income and young consumers, the CFPB said. Inadequate disclosures: Along with charging excessive and unexpected overdraft fees, many of the financial institutions in the report failed to present account information in a uniform way, Pew found. As a result, it's difficult for customers to compare important information like fees while shopping around for an account. In addition, the disclosures are often the length of novels. Of the bank accounts Pew examined, the disclosures ranged from 21 to 153 pages -- with a median of 69 pages. Meanwhile credit unions provided disclosures with a median length of 31 pages. Some of those disclosures are printed in six-point type and many contain such complicated legal jargon and sentences that they become nearly indecipherable, Pew said. If you come across a problem with your account, good luck disputing it in court. Pew found that 66% of the 237 checking accounts offered by the 12 biggest banks require consumers to waive their right to bring a complaint before a jury. To improve disclosures, Pew developed a uniform disclosure box for checking accounts that lays out fees and risks in a concise way to help customers comparison shop. It is encouraging banks to use the form and said that several banks, including TD Bank (TD) and JPMorgan Chase (JPM, Fortune 500), have already voluntarily adopted it.